that’s what SHE said: pinterest ruins bananas, race as a social construct, mom dating, and more . . .
And yes, as much as none of us would likely say that we equate breasts with femininity or beauty, it will be powerful to someone at some brutal moment to have heard her say that she did this and feels no less feminine, no less beautiful, and she’s still with Brad Pitt. That shouldn’t make anybody feel better, rationally, logically, reasonably, it’s just a famous person, it shouldn’t matter. We should look to our parents as role models! To our teachers, our doctors and nurses, our fighter pilots and scientists! Yes, in a fair world, it wouldn’t matter, but in a fair world, we wouldn’t look at the same kinds of women and see them held up as ideals all the time anyway. We aren’t in a fair world, but in a celebrity-infatuated world. It will be powerful to someone whether it should be or not. Someone will think about having a mastectomy and remember that Angelina Jolie had one, and she wasn’t embarrassed, and she still felt pretty, and she told everyone that it can be survived. And she told me that on PINTEREST she learned that if you write letters with a tooth pick on a banana peel at night, the letters will magically appear on the banana in the morning. Do you see what happened there? 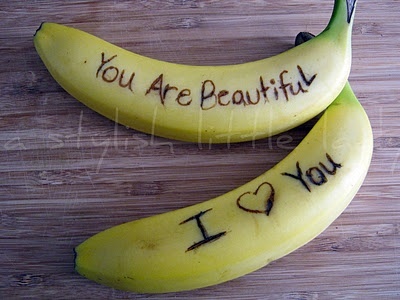 Pinterest ruined bananas. Now we’re all going to have to write NOTES on our bananas and if we hold out, our kid will be the boring banana kid. Unloved, really. The more I think about it, the more I believe this well-meaning statement is not only a manipulative way to try to control our daughters’ behavior, but can also be dangerous to their spiritual health. When we tell her to be an example, we may as well just hand her a mask right there – Here. Hide behind this. Don’t let them see you struggle. I know that’s not what we mean. I know. But it doesn’t matter so much what we mean, it matters what she hears. Sister Megan Rice walked out of the jail and promptly admitted to gathered media that the three had indeed gone onto the property and taken action in protest of nuclear weapons. “But we had to — we were doing it because we had to reveal the truth of the criminality which is there, that’s our obligation,” Rice said. She also challenged the entire nuclear weapons industry: “We have the power, and the love, and the strength and the courage to end it and transform the whole project, for which has been expended more than 7.2 trillion dollars,” she said. “The truth will heal us and heal our planet, heal our diseases, which result from the disharmony of our planet caused by the worst weapons in the history of mankind, which should not exist. For this we give our lives — for the truth about the terrible existence of these weapons.” Then the government began increasing the charges against the anti-nuclear peace protestors. I’m going to go to my Goodwill tomorrow and buy every A&F t-shirt I can find and mail them to The Open Arms Shop. This is a fantastic company that recycles t-shirts into stylish scarves, shirts, and accessories. The thing I love most about The Open Arms Shop, is that they attempt to break the cycle of poverty for refugee women in America by employing them and paying them a living wage. They’re offering community and purpose to these precious women. I can get down with that. I did it, too. I made an idol out of the Church and she fell from her tall shelf in my heart and shattered. The problem wasn’t that she fell. She was never meant to be up there in the first place. The people who have cut me the deepest are the ones that claim Jesus Christ as their Lord and Savior and I just don’t get how it could be so. It turns out I confused wanting to be like Jesus with actually being Jesus. The people that hurt me were the former, but I treated them and held them as the latter. 8. You don’t talk to other adults because your toddler has control of your 100% undivided attention, all the time. You chase him for miles around the park while begging him to come back, you crawl through the tunnel thirty-five times because he said so and you let him bury you in the sand while apologizing that your “active boy” just doesn’t let you have adult conversations. As far as hanging out with Christian kids: I don’t look for that as a standard. We have a kid who lives nearby, goes to church twice a week, is in the worship band. He’s thrown rocks and baseballs at my kids’ heads, stolen their scooters and is mean to them when he thinks I’m not looking and nice to them when he knows I can see. He’s a Christian. A Christian can be wonderful or not. The standard I teach my kids isn’t about looking for designer religious labels but about looking for qualities of love and kindness and making things right when they’re done wrong. If that shows up in Jewish, Christian, Buddhist, Athiest, Whatever-ist, I’m good with it.